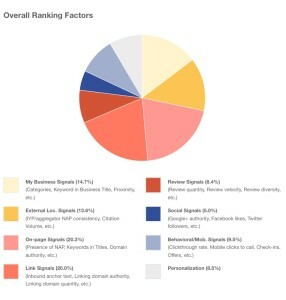 2015 Report on Local Search Engine Ranking Factors for Lawyers – Web Presence Esq. Search engine rankings are big business for attorneys looking to generate leads online. If you’re not on Page 1 of a search result, you can pretty much forget about being found online (80% of online searchers don’t go past Page 1 to find what they’re looking for). From content marketing to SEO to PPC to social search, there does not seem to be a shortage of opportunities to increase a law firm’s online ranking. The big question is: Is what you’re doing working? Moz, a web-based company dedicated to studying the science of search, recently released their 2015 Local Search Engine Rankings Factors report. This report indicates that, not surprisingly, Google places more weight on certain factors than others… So what are those factors and how can you improve your law firm’s search engine ranking? The list continues, but hopefully you get the picture: maintaining an active, strategic presence on your Google+ page will benefit your law firm in term’s of local search. If you’ve been focusing on organic search, do not despair — it is still very important! Organic search results are those non-local results in Google that do not list the business name, address, phone number, website, and reviews. They are the rankings in Google under the local results, and the results that appear if local results (also referred to as “Stack” or “Snack Pack” results) do not appear for that particular search query. Again, the list continues… It is more important than ever to have a professionally designed website that takes the 50+ search ranking factors into close consideration, ensuring your law firm has the greatest likelihood of appearing on the Holy Grail of search — Page 1. Social signals (amount of Google+ authority; number of Facebook likes; followers on Twitter; etc.) still count — so how is your law firm’s social media marketing campaign working? For more information on how to secure Page 1 placement on Google, or to determine whether your website and online presence meets the criteria listed above, contact our legal marketing professionals for a complimentary website audit today.